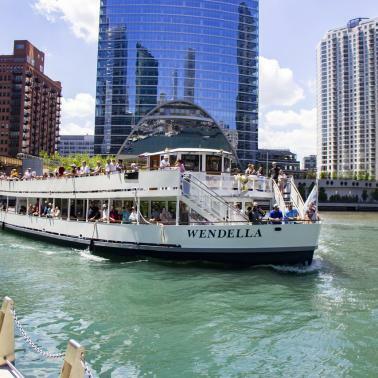 Find outdoor fun, waterside dining, live music and even a wine garden along the Chicago River with this Chicago Riverwalk tour. For a unique city experience, head down to the south bank of the Chicago River and explore the pedestrian-friendly Chicago Riverwalk, which stretches from Lake Shore Drive to Lake Street. This self-guided Chicago Riverwalk tour will keep you busy uncovering riverside surprises. 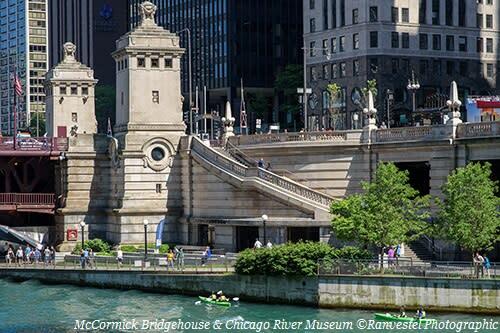 Brush up on your city history at the McCormick Bridgehouse & Chicago River Museum. Enter the historic bridgehouse at river level, where you’ll marvel at the massive gears that power Chicago’s famous Michigan Avenue Bridge. 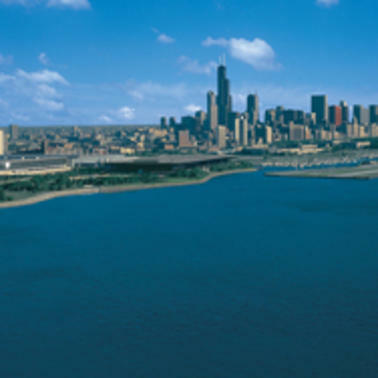 Then make your way five stories up as you learn about the city’s movable bridges and the storied Chicago River. Your reward for making it to the top is an amazing 360-degree panorama of the city and river. Want to trade walking for wheels? Wheel Fun Rentals offers way more than just cruisers and mountain bikes. It features a whole fleet of specialty cycles. An entire family can peddle along in an old-fashioned surrey, although teens will more likely prefer the go-kart appeal of the deuce coupe or low-riding chopper. Take your pick, then take off on a ride along the Chicago River. Ready to hit the water? Get out onto the river with Urban Kayaks. Families and first-timers will want to take the Intro Paddle at Riverwalk, a one-hour lesson that’s a great option for paddlers new to the Chicago River. 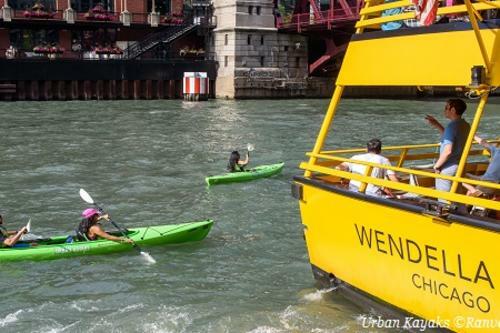 For more advanced kayakers, the 1.5-hour Historic Chicago Tour is a guided excursion along the Chicago River’s main branch. Either way, you can’t beat the rush of kayaking right in the middle of downtown Chicago. 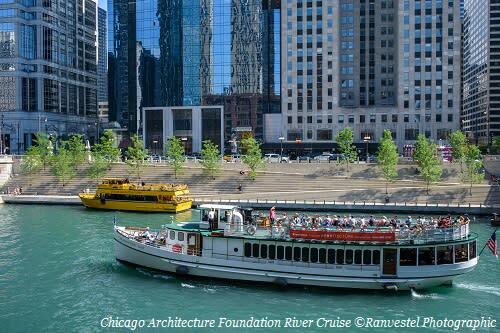 For an astounding view from the water, hop on the Chicago Architecture Foundation Center River Cruise aboard Chicago’s First Lady Cruises. 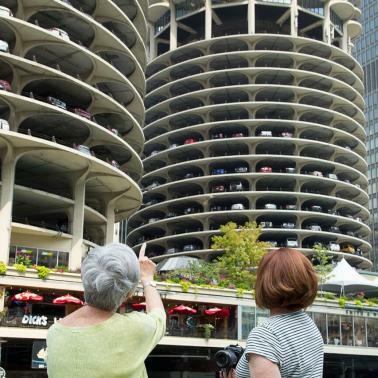 Voted one of the top 10 tours in the U.S. by TripAdvisor, this popular 90-minute cruise is narrated by CAF-certified docents who point out more than 50 architectural gems along the Chicago River. As you pass by you’ll hear about Chicago’s fascinating history and the design giants who shaped the city’s world-famous skyline. Or join Wendella Sightseeing’s Beer & BBQ Cruise. On this relaxing dining cruise, a variety of local craft beers (a different brewery is featured every month) are paired with barbecue bites from Sweet Baby Ray’s. Sit back and watch the awesome scenery of the city unfold before your eyes as the boat makes its way along the Chicago River and out onto the cool blue waters of Lake Michigan. Looking for lunch? Get into the tropical vibe of Island Party Hut Tiki Bar and Grill.Listen to live island music as you lunch on slow-smoked pulled pork and quench your thirst with a refreshing fruity cocktail. Or grab a seat under one of the bright yellow umbrella-topped tables and munch on a burger at O’Brien’s Riverwalk Café. At Tiny Tapp Riverwalk, pair a gourmet slider with a craft cocktail. 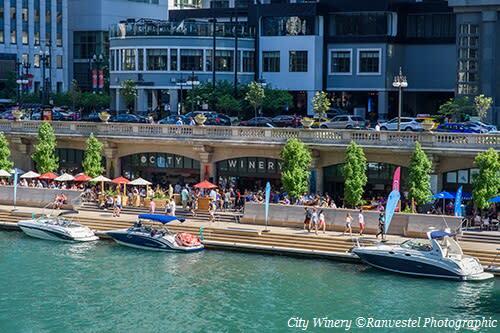 For the quintessential Chicago Riverwalk dinner experience, grab a seat in the wine garden of City Winery Chicago Riverwalk. Sip a glass of the house Riverwalk White or Rosé. Watch the boats glide by and do some serious people watching as you listen to live music. Order the Greek Panini layered with marinated artichoke hearts, olive tapenade and herbed goat cheese. Or share a small plate, such as the dolmades stuffed with rice, mint and spices.